It is always better to have more cash on you than not enough. Don’t trust directions, signs, maps. Seek multiple sources for directions. Warm body language can help break the language barrier. Wearing a flashy blue fleece often attracts unwanted attention. In the airport, accidentally throwing away your plane ticket is a bad thing. Yes folks, in Moscow, during my 2-3 hour transit from Yekaterinburg to Baku, I accidentally threw away my plane ticket. Now, to be fair, I had already been in the Moscow airport on two previous occasions, underwent the exact same security clearances, and my boarding pass and passport sufficed as evidence enough that I belonged on the flight. This time was different. In a much-needed effort to organize, I rifled through my pockets and cleaned out my travel wallet, ridding myself of unneeded ticket stubs, papers, etc. At the gate, I played monkey-see-monkey-do and followed the people in front of me, yet until I approached the front of the line, I did not realize that I was missing a piece of paper. I was ushered aside, people stared, the check-in woman didn’t speak English. Even now, I am not really sure how I got out of Russia, how they let me board the plane without the original ticket. Persistence pays off I guess? When I arrived in Baku, I had to wait nearly two hours for a visa. But the karmic scale tipped in my favor for a second time that day when, after breezing through customs, I saw my pre-scheduled airport taxi pickup waiting with my name in bold. He waited two hours for me. That’s some serious loyalty, and I hadn’t even met the guy. I couldn’t have been happier – at that point I wasn’t in the mood to negotiate with the other cabbies. Work here has been OK for the most part. My hotel is uber-far from the city center, so logistics have been tricky. I don’t think I’ll be able to take my scheduled day off, thus continuing my 3 week streak of working-at-least-once-every-24-hours. No complaints from this guy. The mere fact that I have the opportunity to travel to these locations is reason enough to work my tail off. Baku – a name that could easily pass as a planet in Star Wars – is one of the oldest hubs of international oil activity. The industry was born here. Each day, over one million barrels of oil are extracted here. For some perspective, that’s more than enough to handle the daily consumption of the Netherlands. Intense. Because Azerbaijan was under Soviet rule for so long, most people speak Russian here, so the 10 words that I know have been moderately helpful. 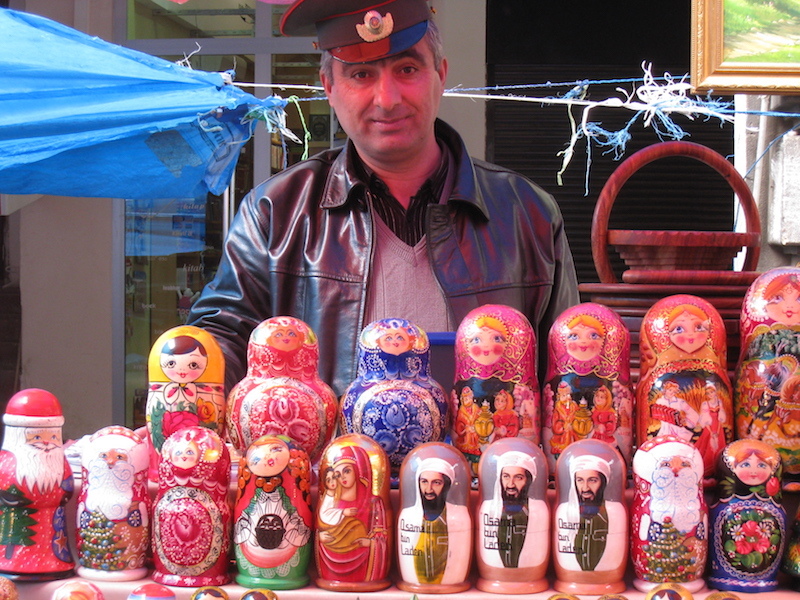 Aside from Russian, the local language, Azeri, is incredibly similar to Turkish. Everyone I have met is more than friendly, this is a great country. Below is a clip of me saying hello. That was Nizami Street, one of the few pedestrian areas where one can escape the maniacal drivers, the honking, the noise. It was a long day at work and my fatigue, coupled with the cold, the rain, was getting the best of me. I decided to head back to the hotel. It was already 8pm, and I hadn’t sat down for a break in several hours. I hopped in a cab (it felt good to sit down), and luckily the driver knew where he was going this time. Back at the hotel, exhausted, eager to sit down for a refreshing brew and relax, I was astonished to see a hullabaloo of activity in the hotel dining room. Some conference or what not. Was told that there was no room for me in the restaurant, in my hotel’s restaurant, and was politely told to check out the bar upstairs for food. The elevator is broken, so I walk up five flights of stairs, only to find that, in an ironic twist of words, no one is to be found. No problem, though, as I had wanted to check out a small sandwich shop around the corner. I braved the rain and grabbed a quick bite to eat, happy that the elevator had been fixed upon my return. In my room, though, the heater had broken, and now, as I write this post, I’m waiting for it to be fixed. Will it be fixed? You can’t make this stuff up. My spirits are high though. Check out the hat I bought today! I put it on to keep warm. Notice anything? Not the best souvenir choice for an American. 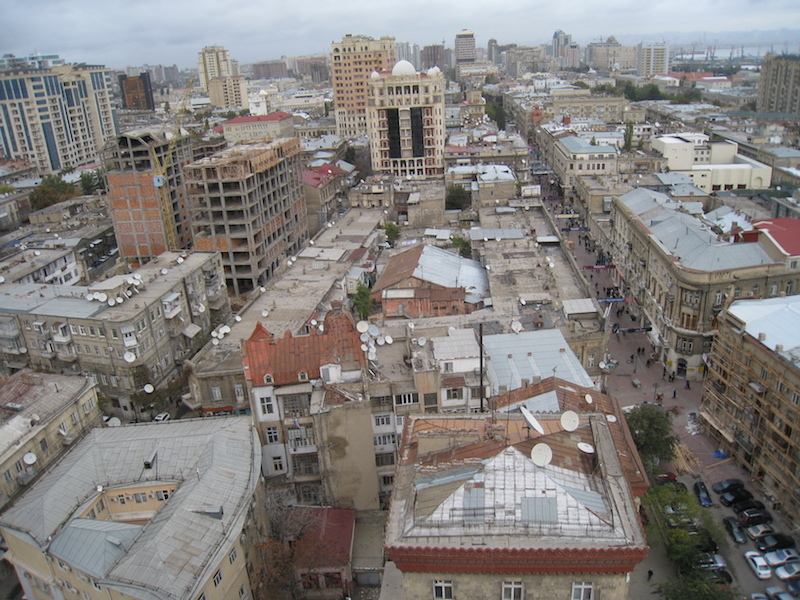 One more – Baku from the top of the Hyatt Hotel.